Natural building is the art of constructing ones home and/or other structures with non-toxic, locally available materials to minimize the impact of that construction upon our earth and ourselves. Why are we involved in Natural Building? You have heard the old saying "Give a man a fish and he will eat for a day, teach a man to fish... Well that is what Empowerment is. By supporting the teachings of cob, adobe, strawbale and other natural building techniques, we are empowering ANYONE to build their own home. A home that is easily affordable, completely nontoxic and achievable for anyone, anywhere to build, now that is worth our efforts! Housing not only in the United States is rapidly becoming unavailable for many who can not "afford" it, let alone desire to build it themselves. The construction industry doesn't care about the toxins it places in your home or the heavy impact the manufacturing of their materials places on the earth. The regulatory agencies have clearly done everything in their power NOT to empower individuals to live the American Dream of building or even owning your own home. 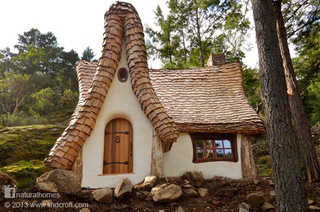 Through sharing the knowledge of ancient techniques and culture behind natural building, YOU can empower YOURSELF to build a house, a barn, an office, a shed, a studio, whatever you want to sculpt with your own hands you can do it with one or many of the natural building Techniques. Learn Cob and Natural Building yourself by taking a workshop.  You can visit the website of any one of our partners teaching natural building to sign up for a workshop. Volunteer on a project that is already underway or one that is schedule to begin soon. Contact us to get an idea of what project are currently happening or upcoming. Donate funds to support and existing project, or consider holding a fundraiser to sponsor a new project. Just contact us to discuss the possibilities. 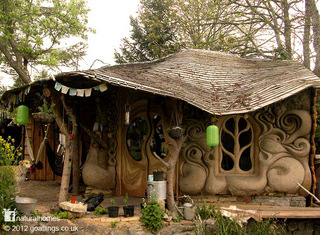 The Laughing House, owned and built by Linda Smiley at Cob Cottage Company. The Goatlings House in the United Kingdom.